Last night I attended the Fathom Events theatrical screening for the Star Trek: TNG 2-parter, "Best of Both Worlds." I was, of course, excited to attend the event and experience one of my favorite television shows on the big screen with fellow fans by my side raucously cheering it on. Although, I entered with some trepidation and lower expectations due to a disappointing previous experience: I attended the first TNG Fathom Event which was a screening of some of the special features and episodes from the upcoming season one blu-rays. It was in one of those generic mega-theaters, packed to capacity and you could tell immediately that the air conditioner was mysteriously turned off. It was already a bad start. Then, when the famous credits began, with the Enterprise swooshing across the screen, it was quickly evident that only two speakers (in the front) were being utilized. Instead of experiencing Star Trek in beautiful 7.1 surround sound in a giant theater, it was standard stereo that I could easily get at home from a 25 year old television. So... as I walked into this different (and smaller, more intimate) theater, I hoped they would not make the same mistake. Unfortunately they did, and I experienced The Best of Both Worlds once again, only in stereo. I'm not sure if this is just the way they have to screen this in theaters, as in the copy of the show they provide to theaters just simply is not a surround sound version, or if the theaters are just doing it wrong... What did you experience? Besides the disappointing sound, the rest of the show was fantastic. At the time the show was about to begin, they aired Star Trek TNG trivia, focusing mainly on the Best of Both Worlds. This allowed the audience to become involved and interact with each other a bit before the main movie began. The trivia was intermittently interrupted by the strange photos that Star Trek fans submitted of their faces on Borg bodies. This would have been fine and even amusing if it was explained at all. Most of the audience was confused as to why they were being forced to look at what seemed to be badly photo-shopped images. Another pre-show feature was the showing of various stills from the upcoming season 3 blu-rays. It would show the original broadcast version of a still from the season, and then with a wipe transition show a still of the remastered version. Some of these were absolutely striking, while others were barely noticeable. I still wonder why they decided to include the stills that had barely any noticeable difference from original to remastered... An odd choice. 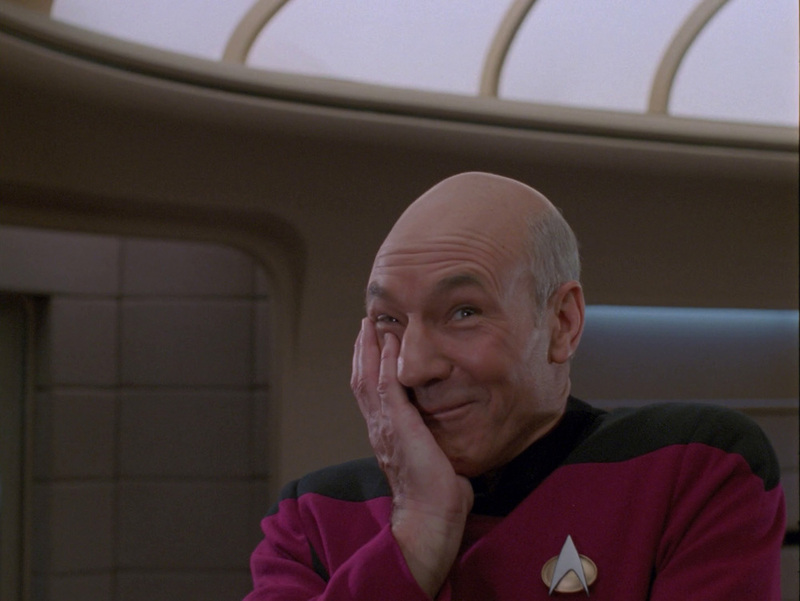 Riker sees what you did there. Then began the making-of documentary for Best of Both Worlds. This included interviews from the director of the episode, Cliff Bole, great anecdotes about the writer Michael Piller, and the surprise treat of it all was the surprisingly detailed stories about shooting the episode by Commander Shelby star, Elizabeth Dennehy. She had what I thought was a very detailed memory of all that happened during shooting. Apparently it was a very formative job of her career. One story she recounts is of Jonathan Frakes telling her to "turn up the heat" in their scenes together because there was no telling where the writers and producers may take their characters in the next season. Apparently even the actors weren't sure if Picard would come back the next season, in which case Riker would be captain and Cmdr. Shelby would take over as first officer. This could then mean Riker and Shelby could either end up hating each other or even become lovers. To all of this, Dennehy responded to Frakes, "Sure Jonathan... I'm sure you tell all the female guest stars to 'turn up the heat.'" In reality it shows early signs of Frakes' budding directorial skill, but in my mind I like to think it is the nymphomaniac version of Riker, popularized by Dork Trek, bleeding out into the real world. Turn up the heat baby! In all though, the documentary was a great production. I just wish they could have something like that for every existing episode of Star Trek. A Trekkie can dream right?! At this point, the actual episode began. Because of the audio issue I mentioned earlier, it wasn't that overwhelming of an experience, but the video was certainly very crisp and the colors vibrant. The best part of these screenings by far is watching Star Trek with a large and dedicated audience. Even though most of us there have seen those episodes plenty of times, we still laugh and clap right when the writers wanted us to. It was also interesting to see how they made the two episodes run seamlessly together like a movie. They even made each "commercial break" seem more smooth. I found it funny how less dramatic of a moment is is when Riker says, "Mr. Worf...fire" and then we immediately see the Enterprise do just that. No cliffhanger, it just moves right on to the action. After the episode followed by a round of applause, the gag/blooper reel rolled. It contained moments all throughout season 3, but quite a bit from just the Best of Both Worlds episode. This reel was hilarious and had the audience roaring. Practically all of these scenes were new. I'm not sure I had seen any of these bloopers before. It felt like I was actually getting new TNG, kind of like the extra minutes added to Measure of a Man in the last screening/blu-ray. I know it may be weird to say, but that blooper reel would have made it worth attending all on its own. To sum it all up, don't miss these screenings! The next time Fathom Events holds one of these do your best to attend! (Sorry for those out of the U.S. and Canada who don't have this option.) Maybe just ask the manager of the theater first if it will really be in 7.1 surround sound. I've been burned twice! That makes for a very angry Vulcan!